Sweat has just won the 2017 Pulitzer Prize for Drama. An explanation for why Donald Trump was elected? That's what Sweat is being called by many critics. 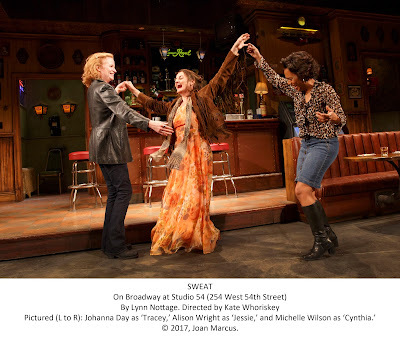 My take on this play is quite different, however, which just proves what a powerful pen playwright Lynn Nottage wields. Nottage, who won a Pultizer Prize for Ruined, her hauntingly lyrical play about women trapped in the horrors of war in the Congo, turns her efforts and character development in Sweat, marking her Broadway debut, to working class Americans in economically depressed Reading, PA. Nottage and director Kate Whoriskey (who also collaborated with Nottage on Ruined) went to Pennsylvania and interviewed hundreds of real-life people for inspiration for the story, which follows a group of friends who have grown up and worked together on the floor of a factory, whose jobs are now threatened by government regulations and the transfer of jobs to Mexico. We immediately know something has gone terribly wrong as the opening scene shows us Jason (Will Pullen) and Chris (Khris Davis) in separate meetings with their parole officer, Evan (Lance Coadie Williams). Once friends, the men are estranged with raw pain still visible, with African-American Chris turning to religion and Jason sporting White supremacist tattoos on his face. We travel back in time (the play takes place between 2000 and 2008, with Jeff Sugg's design projecting dates onto the set) to discover that their mothers also were friends before Chris's mom, Cynthia (Michelle Wilson), was chosen for a management position over Jason mother, Tracey (Johanna Day). The relationships play out in a bar (designed by John Lee Beatty) where Cynthia and Tracey meet to celebrate birthdays with their other friend, Jessie (Alison Wright), who is wasted, trying to get over her ex. They are tended to by the bar keep, Stan (James Colby), who also had worked at the factory before an injury left him with a limp (he and Tracey also shared sparks in a one-nighter that we get the impression he wouldn't mind re-igniting). His minimum-wage employee, Oscar (Carlo Albán), an immigrant from Colombia, dreams of a better life and a union job at the factory. Interacting with the group are Chris's dad, Bruce (John Earl Jelks), who has turned to drugs after being locked out of his plant, but who keeps showing up in the boy’s life despite being kicked out by Cynthia. We see the relationships between friends deteriorate as economic realities reveal racial tensions and a general lack of hope. The politics during the end of President George W. Bush's presidency and that of President Barack Obama are subtle reminders in the background of the dialogue, but not driving forces in the plot of the play. Instead of seeing this group of people as victims, I saw them as the result of their own poor choices. They have a sense of entitlement -- and when they don't get what they want, they make poor choices. · Tracey lets people know the only reason Cynthia got the promotion over her is because she is black, not allowing that her long-time friend might have been more skilled. Then she blames Cynthia when she refuses to take a severance deal and chooses instead to be locked out of the plant. Then she further refuses guilt-ridden Tracey's offers of help. Later, Cynthia chooses drugs over helping her son. · The friends think Oscar's goal of a better life is fine -- until it means that he might get a union position and equal pay -- or worse, take a scab position when they go on strike. · People turn to drugs and alcohol to dull their pain. · Jason and Chris choose to unleash their anger in a senseless act of violence. There definitely is a lot more going on here than a bunch of bad politics and workers losing jobs that are being shipped overseas. Nottage's gift is for developing characters that are fully developed, flawed and human, but still likable. It is a skill that aids her in storytelling, as well. The fact that people can see the message of the action so differently is a testament to her storytelling ability. She doesn't force an agenda down the throat of an audience, but allows them to be moved according to their sensibilities. Stan comments that he isn't going to vote in the upcoming presidential election because "no matter what lever I pull it will lead to disappointment." Who hasn't felt that over the past decade? The conclusion of the play, for example, left me shaking my head. I didn't expect it and found myself questioning the resolution. I also had to admit that these multi-dimensional characters often hadn't acted as I had expected, so maybe I need to go a little deeper to understand motivations. Human emotions aren't easily labeled and sorted into files. And that is real lesson of Sweat: sometimes community exacts a high price and drives people to desperate acts. We aren't always going to agree on what is the best course of action-- for some, that included electing Donald Trump president – something many others can’t understand. But we have to find some way to respect, understand and accept each other. "Most folks think it’s the guilt or rage that destroys us in the end, but I know from experience that it’s shame that eats us away until we disappear, " Evan counsels his charges. "You put in your time. But look here, we been talking, and we can keep talking, but, whatcha gonna do about where you’re at right now? You hear me?" It's a difficult lesson, lovingly written.